The Book Designer unveiled its October 2018 e-book Cover Design Awards today, and you'll never guess who garnered an honorable mention gold star. Okay, maybe you will if I give you a big enough hint: It was the author's second such honorable mention in a row. Ringing any bells? Okay, it was me. Well, I didn't design the cover, so credit goes to Ebook Launch, the company that designed both honored covers (as well as the next one, so maybe there will be another gold star coming next year). But it was my concept. And I'm the one who had to go back and forth, saying, no, not quite, change the lettering, change his face, change the color, etc. 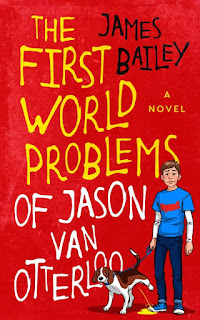 Joel Friedlander, who runs the Book Designer site, made this comment about the cover for The First World Problems of Jason Van Otterloo: "Charming and well integrated, the hand lettering helps to create a unique look." He makes comments on most of the entries, saying what worked and what didn't. 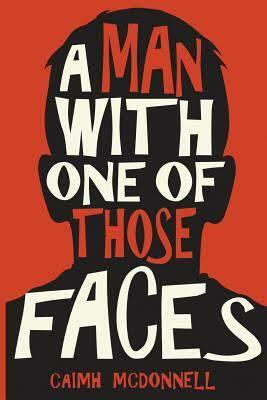 Some of them are quite entertaining (read: brutal) when he's not in love with a particular cover. For example, "Terminally boring. Why would anyone care?" Ouch. That would smart a bit. Amazingly, each month a handful of authors will submit covers they designed themselves. As if they haven't learned over the years to hire this job out from all the previous critical comments. 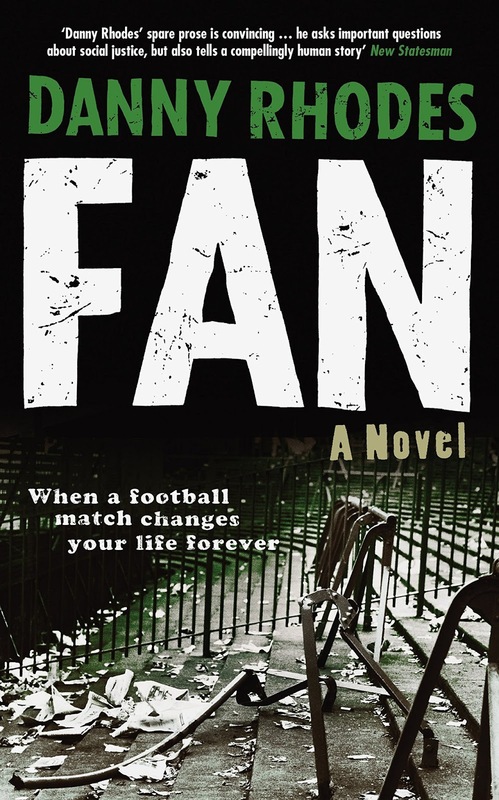 It's hard enough catching readers' eyes with a professionally designed cover. Why anyone would go the DIY route is beyond me. I'm sure glad I didn't. I'm happy with the covers of all four of my books. The first two were done by a graphic designer I worked with at Baseball America. Considering she didn't specialize in book design, I thought she did a great job with them. 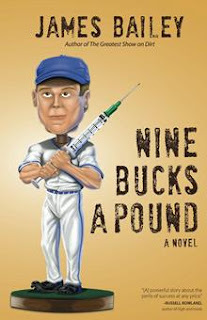 I particularly love the bobblehead on the cover of Nine Bucks a Pound, which was created by another designer and then used as the focal point of the book cover. Did you know it's just six (6) weeks until Christmas? Yeah, sneaks up on you fast, doesn't it? It's easy to keep track of the holidays where I work, because it neatly coincides with layoff season. For the past 10 years, November has been the month to keep your head down. I've seen them come, I've seen them go, and somehow I always survived. Yep. My number came up today. Seventeen and a half frickin' years, and I got called into the 9:00 meeting with HR. It wasn't a surprise, necessarily. Well, the part where they're closing our entire office (400+ people) was kind of a stunner. But there have been enough warning signs that I saw this coming. I've seen it coming for several years now. And after all the gallows humor and hallway chatter ... it still kind of hurts. Even though it may be for the best in the end. Funny how life imitates art. Or maybe art imitates life imitating art. I started a blog to make the marketing of The First World Problems of Jason Van Otterloo a little more fun. It's Jason's blog, but shhhhhhhhhh, I write it. Last week Jason got laid off. I had to use my imagination a little to picture how it would all go down for him. I don't have to imagine it any more. I lived it this morning. 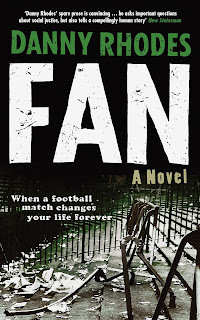 Do you like reading YA? Do you enjoy humor? Are you on a budget? Man, have I got a deal for you. 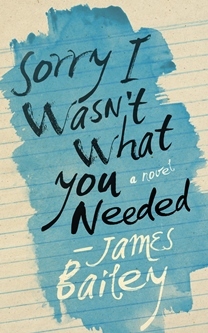 Imagine a cross between Nick Hornby's Slam and The Secret Diary of Adrian Mole (please tell me I'm not the only one who has read and loved both of those) and you'll be on the right track. If that sounds like something you'd be up for, drop me a line, either by email (jamesbailey@rochester.rr.com) or on Twitter, and I'll shoot you a link that will let you download the entire book in your preferred ereader format from Book Funnel (no membership required, though you may need to install their app). Simple, right? Well, what are you waiting for? Let's do this. 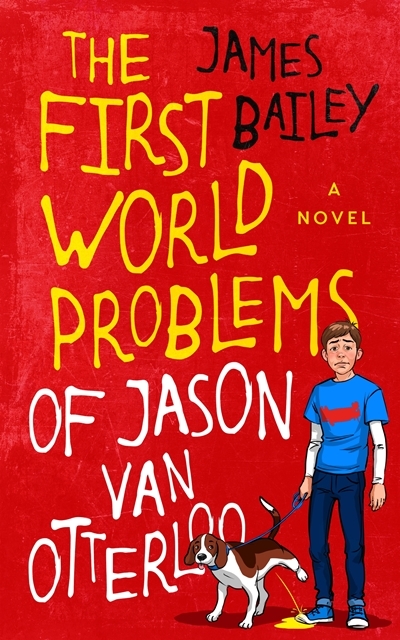 Back in March, on this very blog, I boldly announced my new book, The First World Problems of Jason Van Otterloo, would be "Coming Summer 2018." I figured that gave me a reasonable three month window, three months down the road. Very doable. Or so I thought. Well ... some things just take a little longer than I think they will. On and off over the last several years, I'd been keeping my eye open for a local critique group. In my head, it was a handful of writers who met every month in a bar somewhere and spent a couple of hours sharing feedback on each others' works. We'd each credit the others in the Acknowledgement pages of our novels and move on to the next round of drafts (and draughts). But I never found the secret bulletin board where this group was posted, and it lived only inside my mind. This past January, I discovered Meetup.com, which for perhaps apparent reasons I had previously dismissed out of hand as a site for finding discreet partners. Turns out it's nothing like Adult Friend Finder, and you can instead discover groups that knit, hike, and even critique each others' writing. However, there were no writers groups that met during non-working hours. So I started my own. Instead of a bar, I scheduled the first meeting in a coffee shop. Five other writers showed up, which surpassed my expectations, as I'd imagined the horrible awkwardness of sitting across the table from one other person, much like a "party" I hosted one night years ago. We laid out some basic ground rules about how much was reasonable to expect each other to read each month (in the neighborhood of 10-12 pages, double spaced) and what was the best way to share our work (we settled eventually on emailing it around to the group). It was decided that the coffee shop was too loud for us to all hear each other easily, and we searched for a new home, eventually settling on a somewhat centrally located library with reservable rooms. It's been three years since I released Sorry I Wasn't What You Needed. Three long years. What the heck have I been doing all that time? I'm currently on the nth round of revisions, with at least one more pass to come. I'm still toying with releasing both books together, but the longer things drag out, the more I rethink that. If you'd like to be the first to know when they are available, please sign up for my email list. I promise, I do not spam. I only send messages when I have something significant to announce (which as you might guess from the fact it's been three years since the last book came out, isn't all that often). As an indie author, I have a soft spot for indie artists generally. 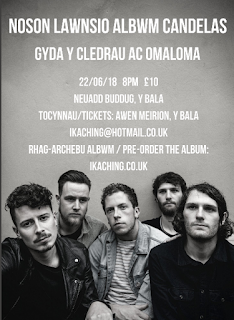 I particularly love to discover a new band that hasn't broken big (yet). I've found bands on Twitter, sometimes from a tweet recommending them (Rizzle Kicks, H/T to James Corden), and sometimes via direct contact from the band itself (Lux Lisbon). Discoverability has always been the key to an artist's success, but discoverability is so different now to what it was a generation ago. Musicians can find an audience halfway across the world without trekking there in a broken-down van to play a crowd of 20 people. Sometimes purely by accident. My son is 8 and into music. If you drew a Venn diagram of what we like, there'd be a reasonable sweet spot in the middle. Most of those songs are ones I've introduced him to, despite his initial reluctance to give anything I like a chance. From AC/DC to Trombone Shorty to Snow Patrol, he has added a fair number of my tracks to his mp3 player and/or Spotify list. It doesn't often flow the other way, though. He gets a lot of his music from whatever they play on Dude Perfect, which mostly all sounds the same to me, bland synthesized music and cliched lyrics that play well behind footage of morons performing trick shots. Seven days ago, 17 lives were needlessly lost in the horrific shooting in Parkland, Fla. My first awareness of it came via Twitter, before any details were available. Another school shooting. The all-too-familiar depression and hopelessness that washes over me during these incidents struck me harder and harder as information was reported. Many injured ... multiple fatalities ... more than 10 deaths ... then, finally, 17 dead. And eventually a grim sense of relief that the count had finally stopped going up. I had taken the afternoon off to buy and prep a steak for our traditional Valentine's cookout. But by the time my wife got home from work I didn't feel much like celebrating anything. It felt wrong to be grilling--to be doing anything I enjoyed--with such a tragedy for all intents still unfolding, knowing so many families were being irrevocably torn apart. I felt more like crying than anything else. But I put my best face on, partially because I still don't want to talk about things like this in front of my son. He's 8. He shouldn't have to know these kinds of things happen. Every morning during the week, I wait for the school bus with my son out in front of our house. Yesterday morning something looked different. It took my brain half a second or so to process it, because it was so unexpected. 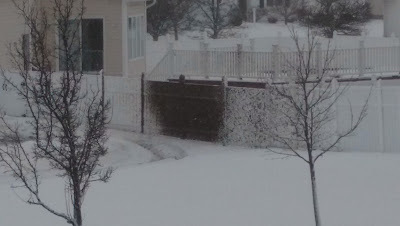 An entire panel of my neighbor's fence had been turned from white to black. Theirs is a corner house, and over the years they've been victims of a number of lawn jobs, which sadly seem to happen on a semi-regular basis here in Suburbia. This time, however, it appears to have been an inside job. Those tracks in the snow come from the driveway, where I'm guessing someone was blocked in. There are five driver-age occupants there, requiring quite a bit of car shuffling at times. My working hypothesis is someone was parked in, decided it would be quicker to pull across the lawn than get the blocking vehicle moved, got stuck, and spun their tires until the sky rained mud. I only wish I could have seen it, because it must have been spectacular. I mean, if you look close enough, you can see mud on the fence surrounding their pool in the backyard. How high must have it been arching through the air? I bet it was beautiful. In a dirty, muddy sort of way. And in the way that things like this are always more spectacular when it's not your fence.